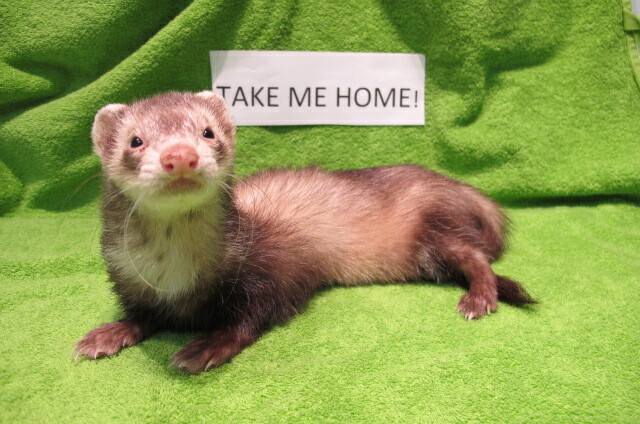 A woman called today to say that the ferret we found belongs to her daughter. His name is Buddy and he ran out the front door 3 days ago. She will be reunited with him this evening (I asked her to bring pictures as proof of ownership as we’ve been getting some interesting calls from interested ferret enthusiasts) I’d like to thank David, Anastasia and Jay for being kind enough to collect him from the street and bring him here and thank you to the lovely woman who brought him an array of ferret food and accessories to make him comfortable as well as passing out our flyers. I’ll let you know if anything changes.Thanks for your help with the blog.